YnM's weighted blanket ($69 - $199) is a best seller on Amazon with over 1,000 5-star reviews. Weighted blankets create the illusion of being "grounded" or hugged - similar to swaddling babies or putting "thunder jackets" on animals - and decrease stress and anxiety while improving sleep and potentially overall health. I've been sleeping under the YnM blanket for a few weeks, and it has helped me fall asleep faster, wake up less frequently throughout the night, and feel more rested during the day. Before I tried one, the simplicity of a weighted blanket - literally, a blanket with weights in it - seemed disproportionate to the miracle it promised to perform: natural calm, dissipated stress and anxiety, and deeper, more restful sleep. Bu, there's a bit more to it than just fabric and a heavy filler. Weighted blankets work through deep pressure touch simulation therapy (or DPTS) - a simple but effective aspect of our biology that we've been employing for years: swaddling babies, placing "thunder jackets" on dogs, and using weighted blankets for therapeutic treatment of sensory disorders, anxiety, depression, autism, insomnia, and more. While light touches can alert the nervous system, deep pressure (such as a good massage or tight and heavy blanket) has a relaxing, calming effect on the body. More specifically for sleep, deep pressure relaxes the nervous system and encourages serotonin and dopamine production, which makes you happier. Then, serotonin converts to melatonin, and that makes you sleepy. The tangential feelings of calm, safety, relief, and comfort only aid in your body's natural processes. There are studies that actually demonstrate how grounding the human body during sleep measurably reduces or eliminates pain and stress. This is why weighted blankets aren't the gimmick their simplicity - and zeitgeist enthusiasm - may suggest to the uninitiated. For the last couple of weeks, I've been sleeping under the 15-pound, 60 x 80 weighted YnM blanket ($103.50), which is a little over 10% of my body weight (the preferred method of calculating which weight to purchase). It's a best seller, has 1,000+ five-star reviews, and comes in 10 colors and 12 sizes - a greater breadth of options than I've typically found. The real draw is that YnM's version is relatively inexpensive, made from breathable cotton, has segments that prevent the weighted beads from dispersing unevenly, and comes in sizes large enough to span your bed as a normal blanket rather than only personal-sized. I'll get into the nitty gritty below, but I didn't know how much of an improvement there was to make in my sleep until I started using weighted blankets. I admittedly love comfort more than the average person, but I'd call them one of few products that bring me closest to the high bar of genuine "joy" Marie Kondo famously uses as a selective litmus test for possessions you should keep or throw out. When used for relaxation, I feel cozy, and when used at night I fall asleep faster, sleep deeper, and feel more refreshed the next day. When I'm traveling, I miss it. I've recommended it to friends who suffer from insomnia and heard similarly enthusiastic feedback. My only complaint with weighted blankets is that they can work too well. My sleep is deeper and more satisfying, but that can be accompanied by a groggier morning. Instead of feeling fully awake when my alarm goes off, getting adjusted to the day can be more difficult. Having said that, this is a con I'm fine living with for better sleep and more stable energy. You could potentially mitigate this with an alarm that tracks your sleep and wakes you when you're closest to consciousness, but my indiscriminate Echo alarm can be abrupt. The YnM blanket specifically is a good version of the weighted blanket. Along with the material, segmentation, and size and color options, you can also cover it with your own choice of removable duvet cover (not included) since the functional fabric may not mix with a fashion-forward decor. It's thin and compact enough to be unobtrusive if you choose to keep it underneath a larger comforter, and has what the company calls a "unique seven-layer system" that's designed to comfortably surround your body and form to your shape. Additionally, YnM supposedly uses more beads and less fiberfill for better overall temperature control. I haven't cut it into pieces and assessed the ratio myself, but it has been a more breathable weighted blanket than I expected. 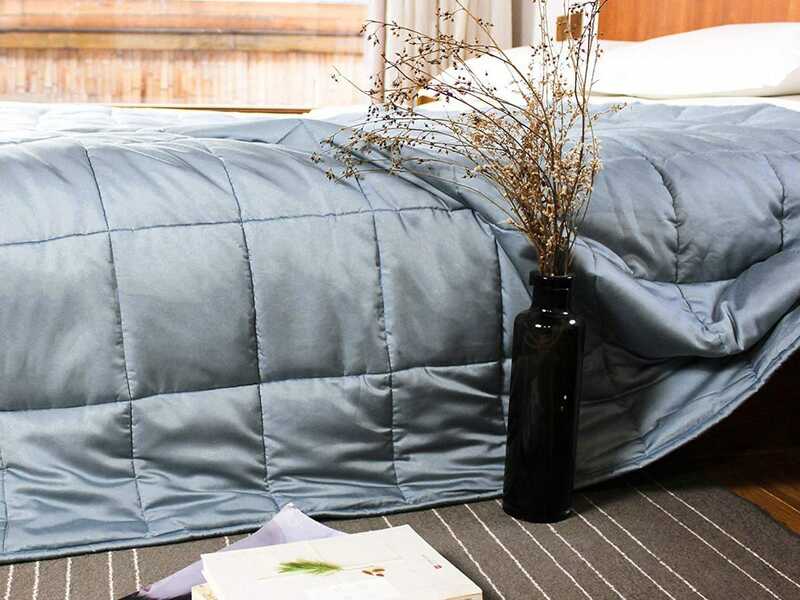 All in all, YnM's weighted blanket is a great option; it's breathable, versatile, uniformly weighted, and comes on the less expensive end of the weighted blanket spectrum. It has markedly improved the quality of my sleep, and it's something that has made me genuinely excited to climb into bed after a long day. If you want better sleep or a new natural tool to combat anxiety or stress, I highly recommend you give it a shot. 9What happens now Theresa May's Brexit deal has been defeated?